The residents of Radiator Springs have all been celebrating "Haul-O-Ween" in their ways, often extravagant and exceptionally cute. 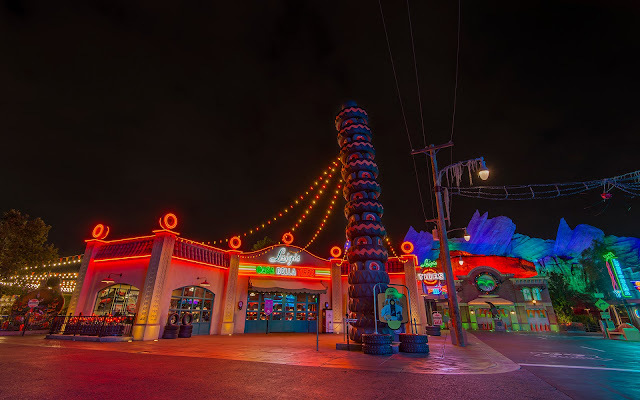 Luigi's seems to have taken a more subtle approach, changing out the lights and putting up some "orange-wall" tires to mark the holiday. He and Guido also play host to the Horn-O-Plenty, a mysterious artifact unearthed decades ago and laden with seasonal gifts. It's a fun way to celebrate the autumn season! Luigi's takes on a subtle Halloween overlay during Haul-O-Ween!